August 20, 2006 -- Whenever folks start looking more closely at an issue for a new discovery like a doubled die, they tend to find other thing too. 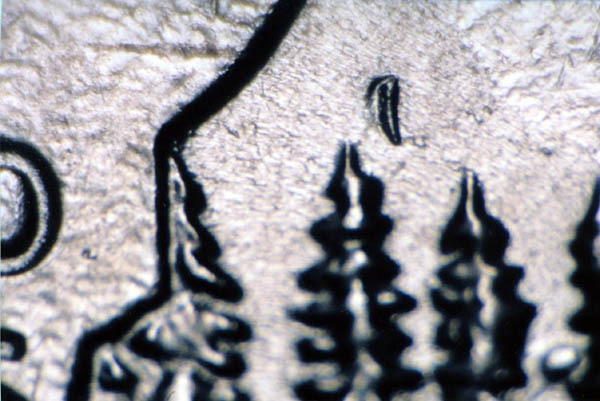 The search for 2005-P&D Minnesota quarters with the "Extra Tree" doubled dies is no different. Lots of minor variety types and strike doubling damage is being found and submitted. Perhaps one of the more interesting that came in is a leaf-shaped die dent that appears in the field over the second evergreen tree from the right of the state outline. One can see evidence of metal displacement that surrounds the dent as a sort of trench all around its perimeter. When a die is dented metal is of course pushed down. In reaction, metal may be displaced upwards outside the perimeters of the dent. 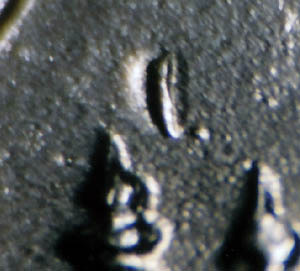 When the die is used to strike a coin the recessed dent is evidenced on the coin as raised metal while the raised area of metal displacement on the die shows as a shallow trench around the dent. 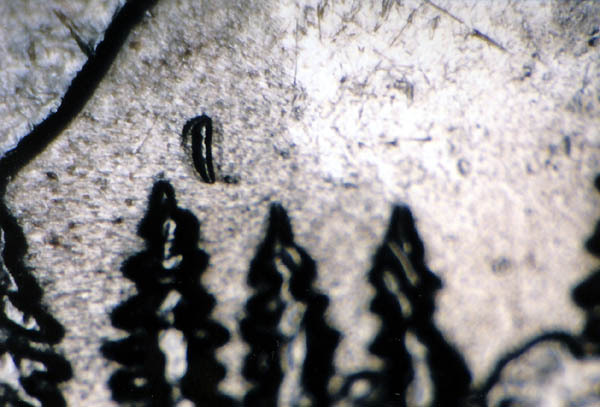 We often see this effect around Mintmarks that were punched into the dies. So far at least three persons searching for the Minnesota doubled dies have found examples of these die dents with the first one reported to me by Colleen Prebish on July 28 and another one coming in from Dave Serbonich on August 6. Both specimens are shown above. Unless otherwise stated, all Photographic Images are by Ken Potter. Copyright Ken Potter, 1993-2006. Use of images in any manner is strictly prohibited without the express written permission of the copyright holder.